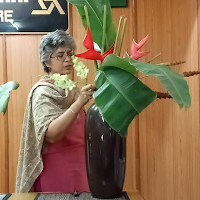 Sensei Malathi was requested to create a celebratory Ikebana piece, for the reception hosted by the Consulate of Japan in Chennai, on the occasion of the birthday of the Emperor of Japan. 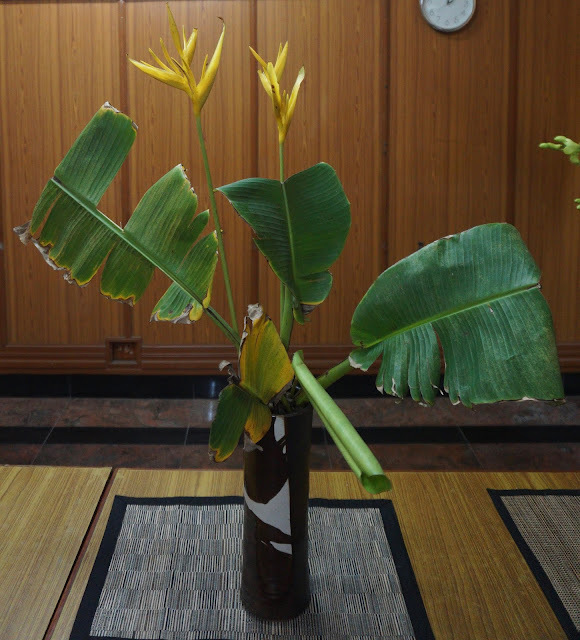 Using a nagiere vase with a golden sheen seemed appropriate for the celebration. 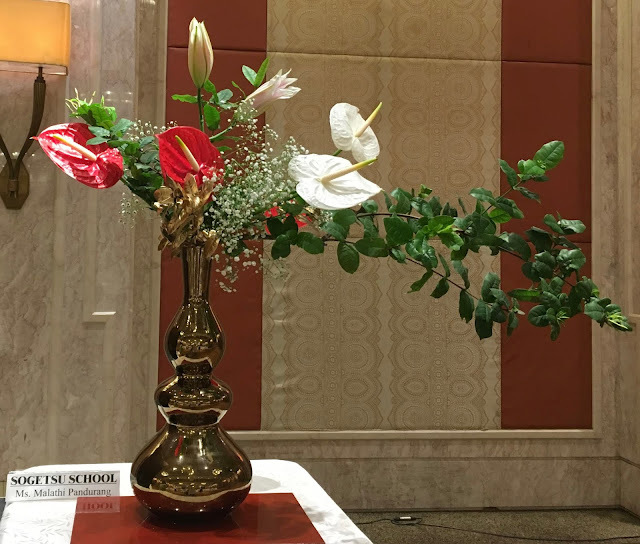 Sensei Malathi opted to use ixora branches, with anthurium flowers, sprays of gypsophila, and buds of Oriental Lily for this gorgeous composition. Consul General Uchiyama makes his opening remarks, flanked by the arrangements done by Cherie Venkatesan of the Ohara school and Malathi of the Sogetsu. 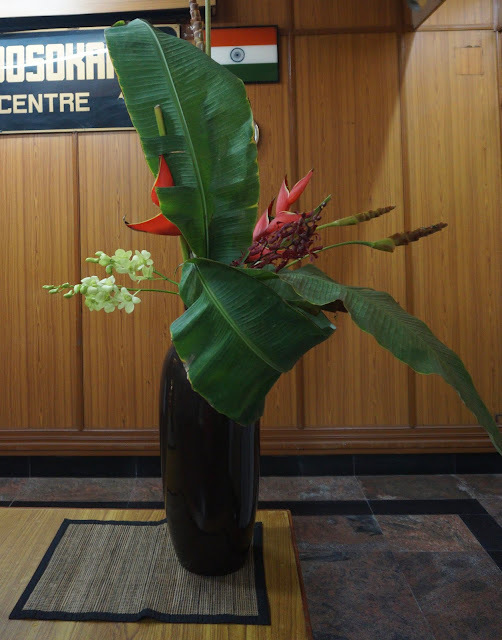 The arrangements aptly depict the national colours of both the countries. 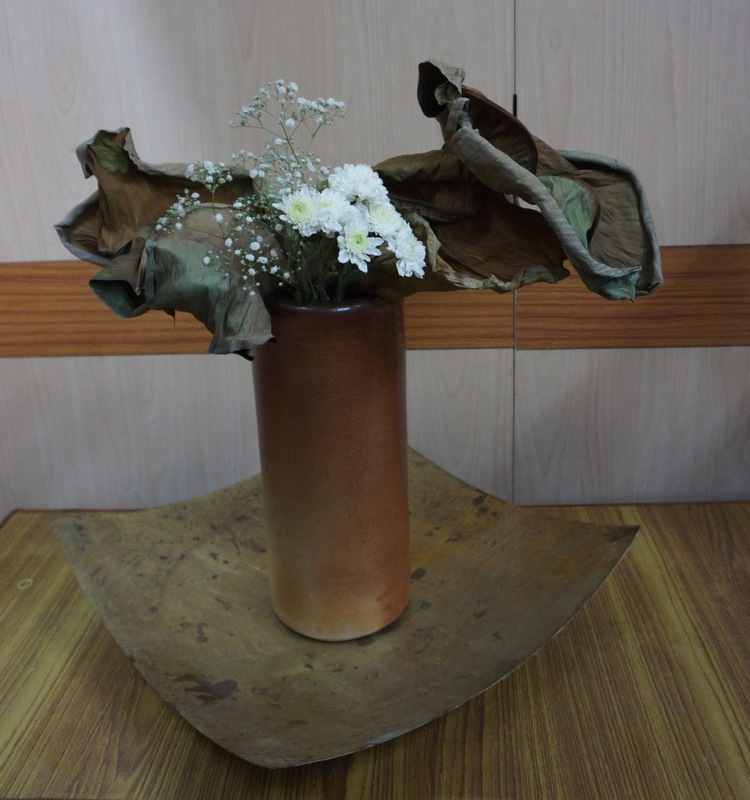 Mr Uchiyama emphasised the long and deep ties between the two countries. 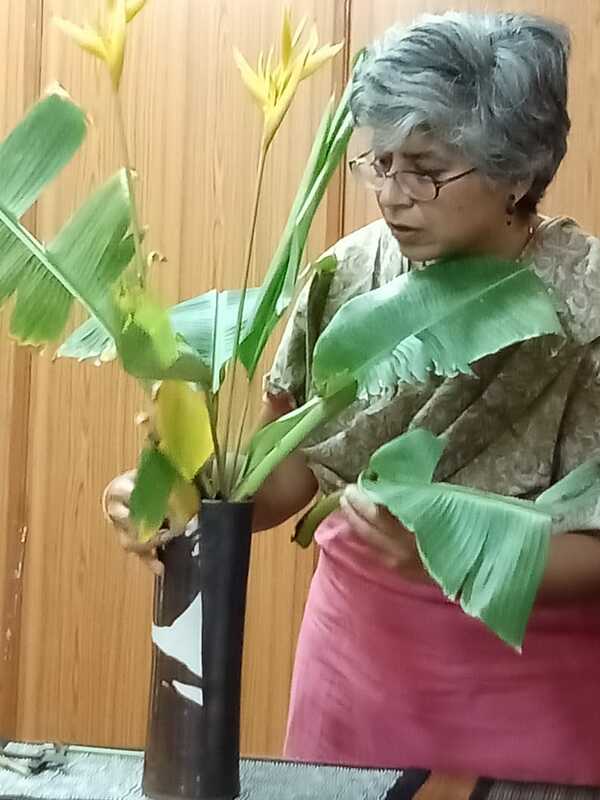 Twelve members me for the November workshop, under the threat of cyclone Gaja, which turned out to be a non-starter over Chennai. 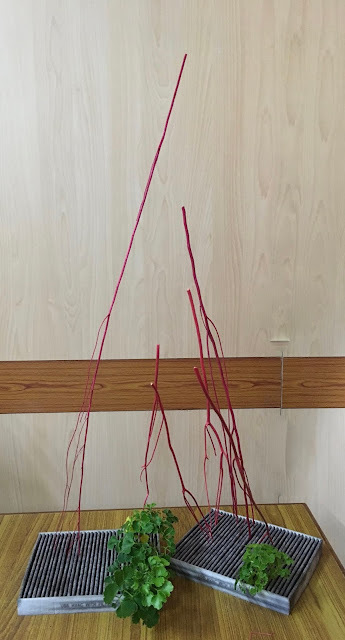 Our theme was "Balancing Lines", and this was to be followed by a presentation of the visit of our members to Delhi to attend the workshop conducted by Christopher Lim. container emphasising lines in various forms. 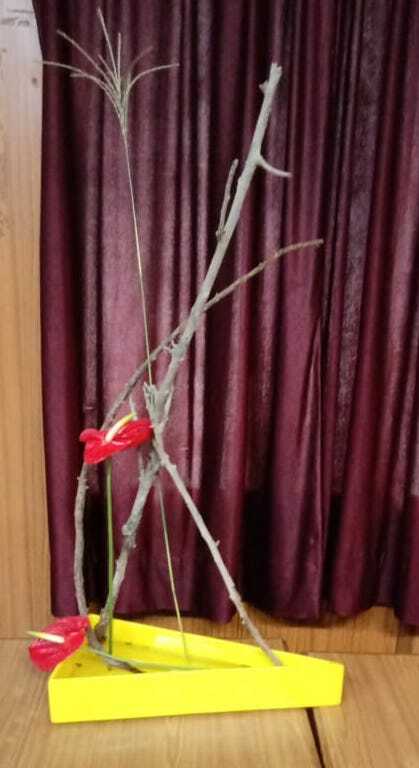 with a branch of orchid to add some colour. 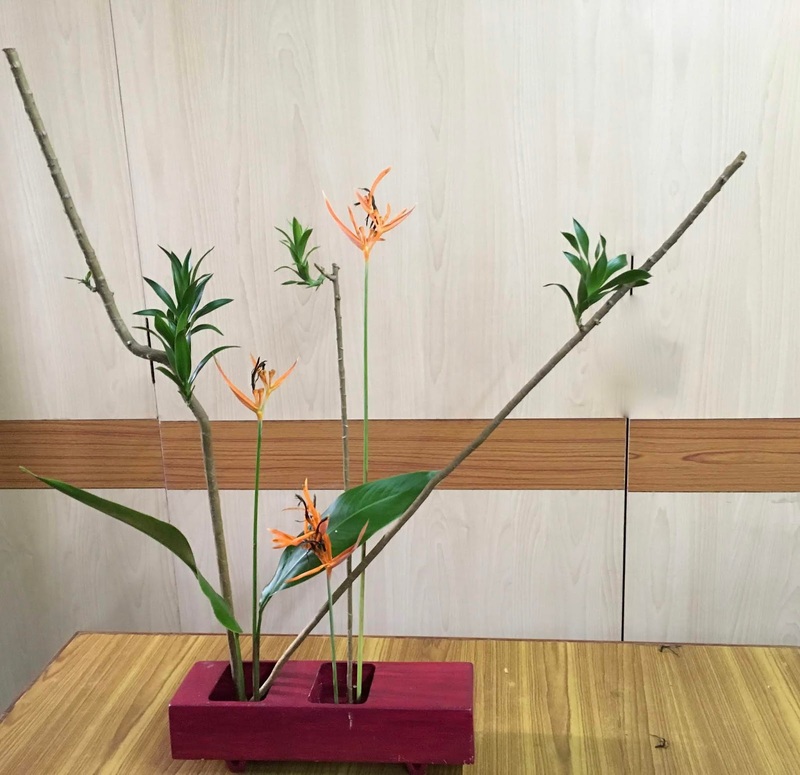 Sensei Malathi balanced dracena and heliconia lines in a rectangular red Sogetsu vase. 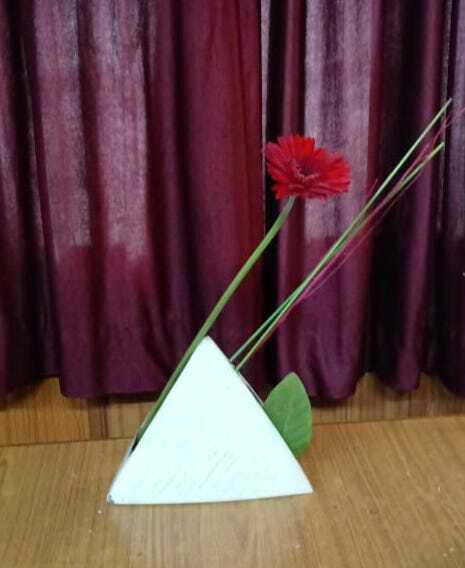 Roopa - Abstract arrangement in a triangular container with slanting lines and a gerbera for colour. interlocked around a ceramic bowl for balance. 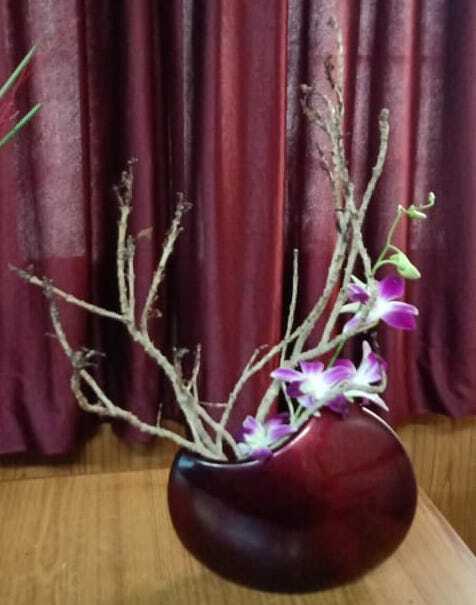 few orchid leaves at the base are arranged to give depth. and one large dark red anthurium. 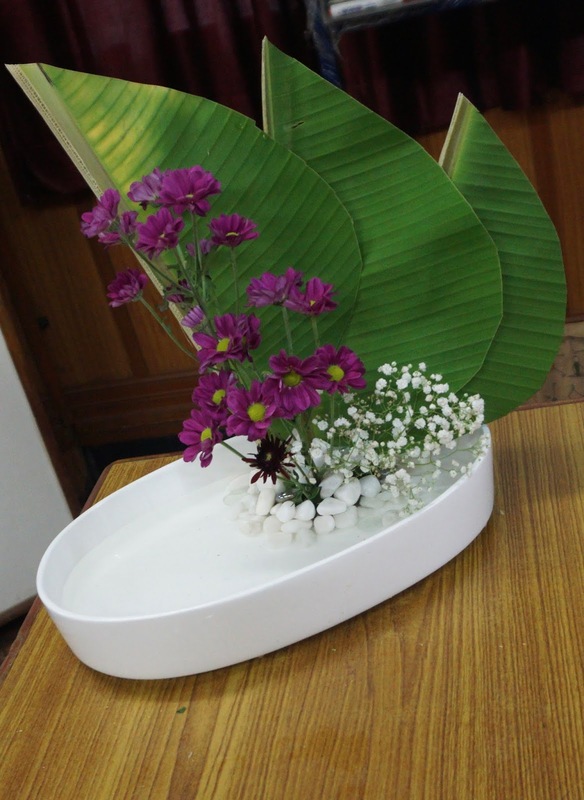 And I have used one green fern. forward gives relief to the arrangement. Pink carnations in their midst. This was followed by some tasty refreshments, and after some technical hurdles, we managed to take a look at the pictures of the Delhi demonstration of sensei Christopher Lim, where he focussed on balancing lines, and the creation of large structures. 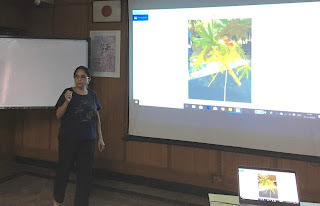 Or members who attended the demo and workshop - Prerana, Meenu, Trishala and Jyotsna - explained with the help of a slideshow some of the highlights of what they experienced. We missed those who did not attend, and look forward to our December meeting. 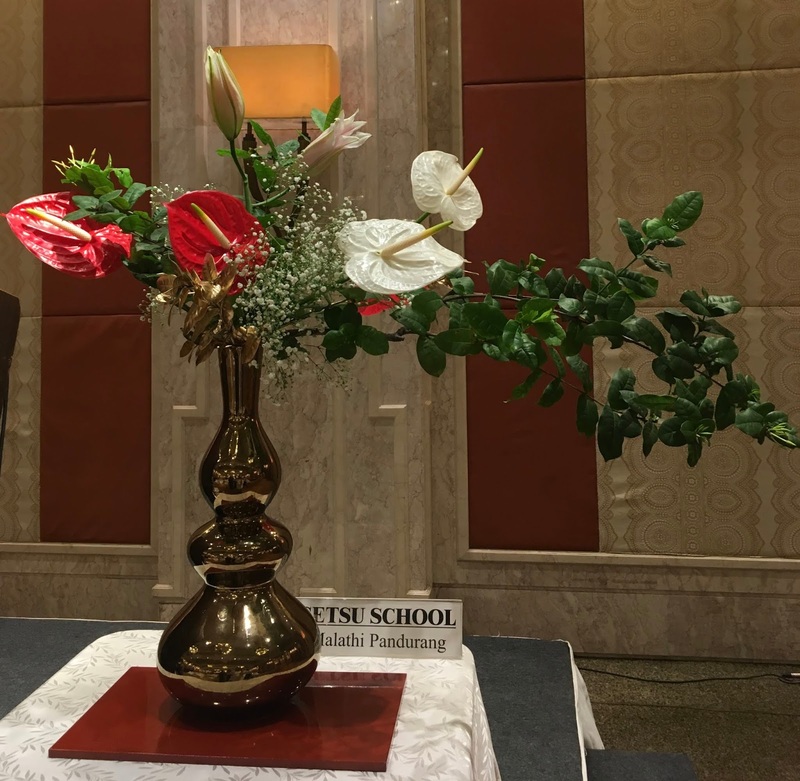 The Chennai Sogetsu Study Group took part in the Japan Cultural & Sports Festival on 27th & 28th October 2018, organised by the Consulate-General of Japan in Chennai and the ABK AOTS Dosokai Tamil Nadu centre. The festival included a mini marathon, demonstrations of Judo, karate and Kobudo, film screenings, Origami, bonsai and our Sogetsu Ikebana as well. 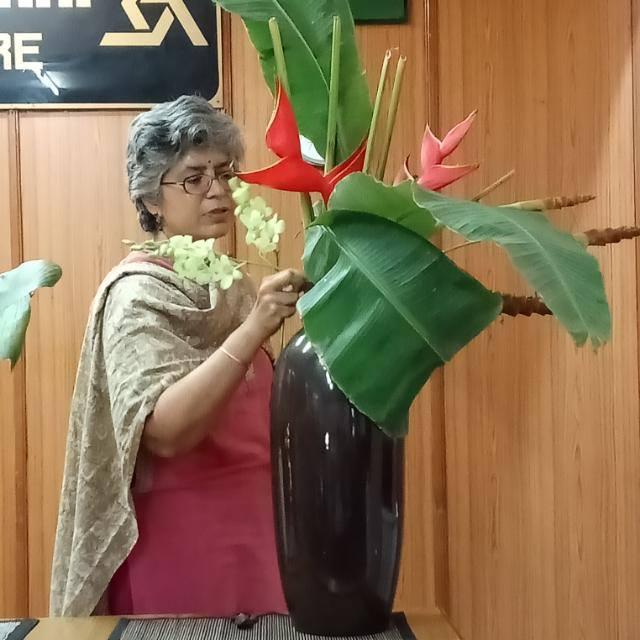 There were 14 exhibits done by members. 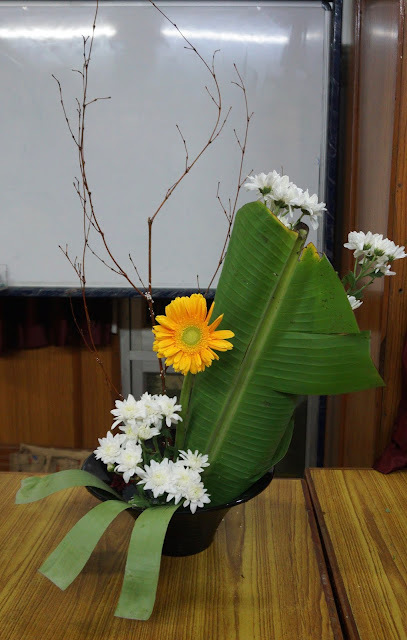 Arrangement pictures are up on our Facebook page, which can be accessed here. Banana leaves are an integral part of Indian culture and flora and diet as well. 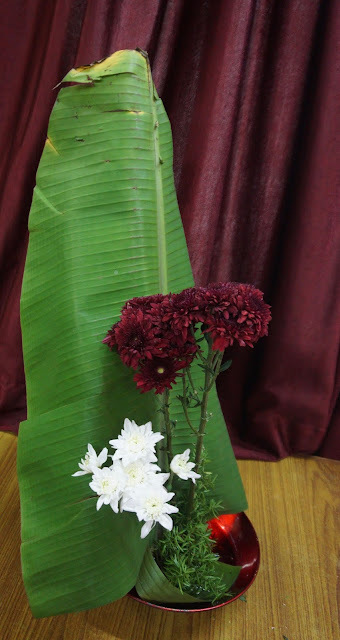 We Indians use all parts of the banana plant, from using the leaves as plates, to eating the bananas as fruits, cooking the raw ones as vegetable, and using the flower and stem in our cooking! 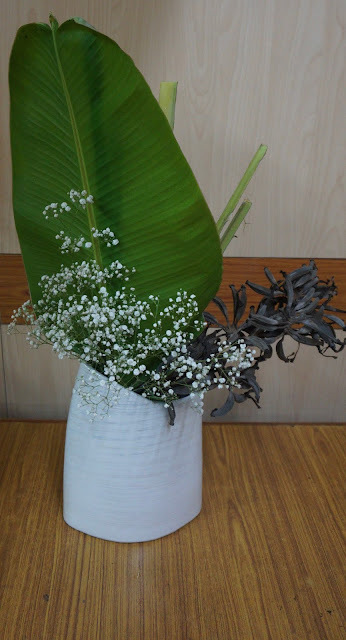 Banana stem fibre used to be used to tie flower garlands too. 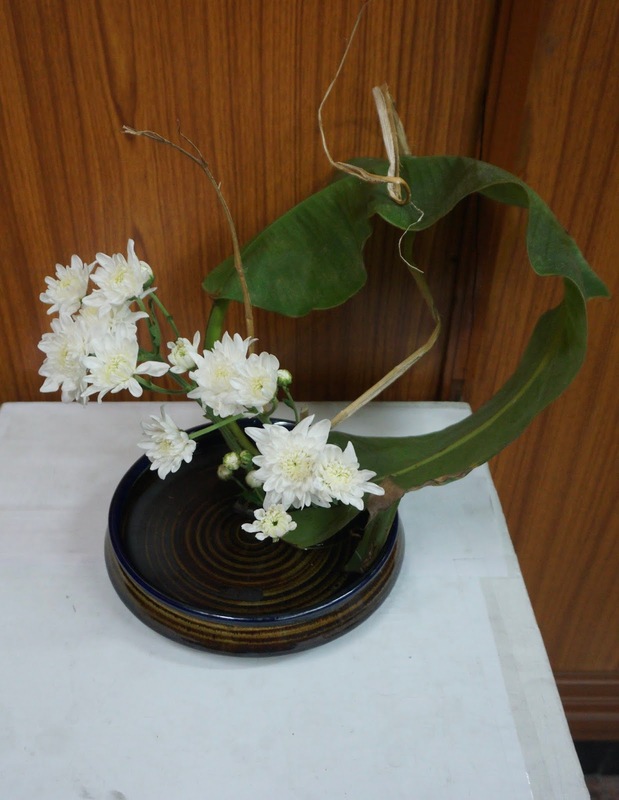 As a Study Group we have not used this material in Ikebana, and so Ambika decided to experiment with that in her demonstration. Thirteen members were present. 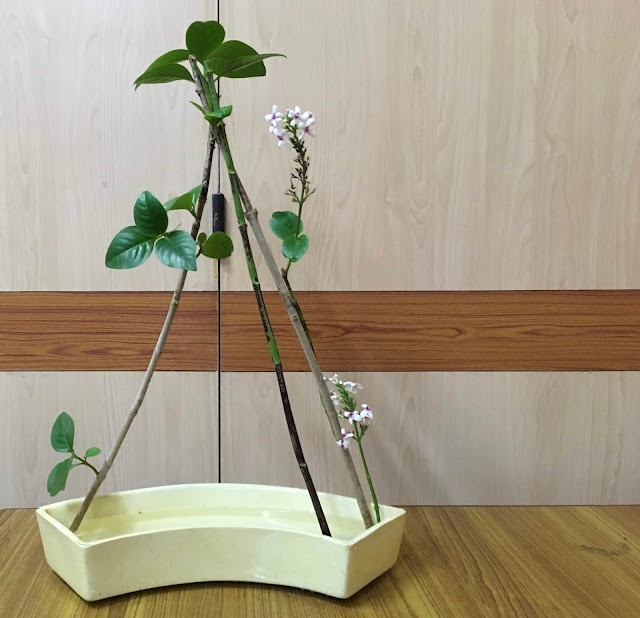 She used the surface in various ways. 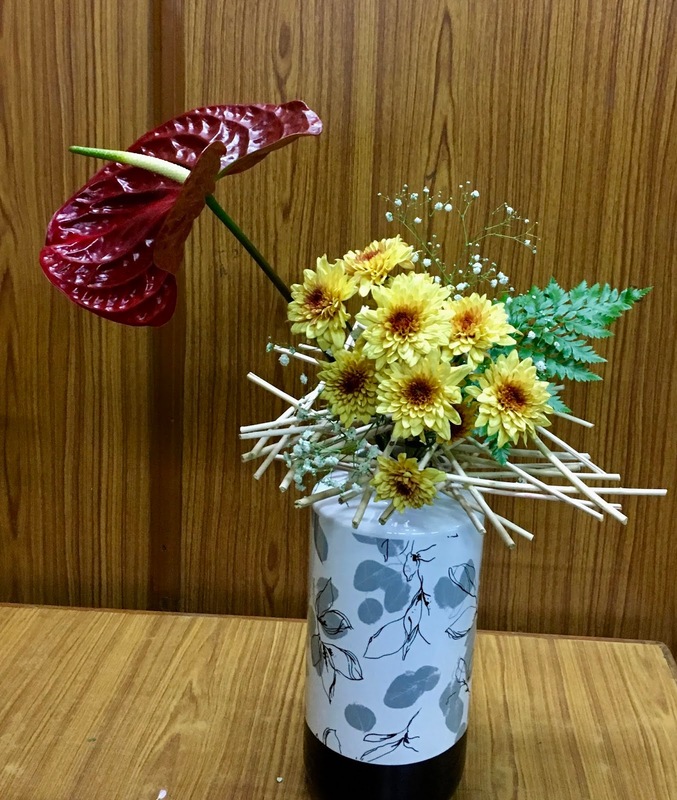 that would bear fruit, symbolised by the vibrant anthurium. with the fairy lights adding the glow of happiness that a wedding symbolises. 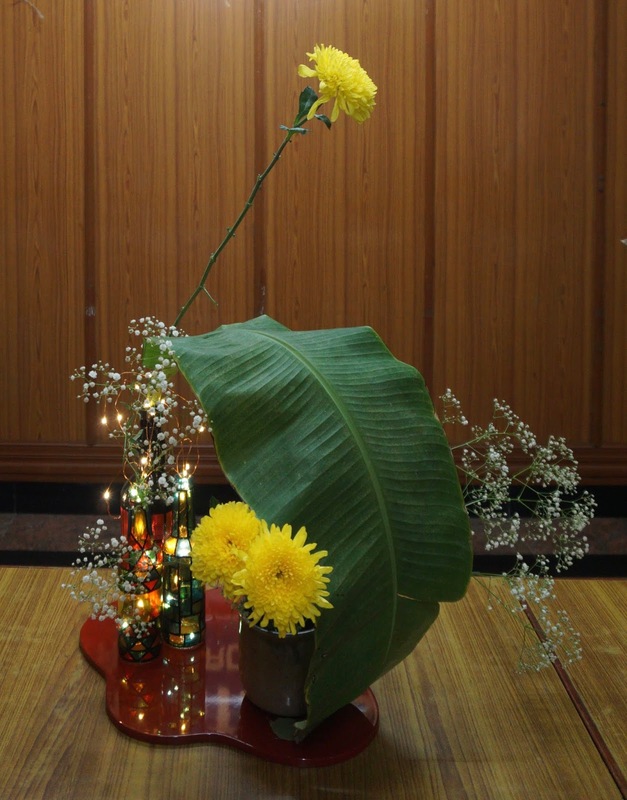 chrysanthemums, and the gypsofilia brought innocence and romance to the composition. 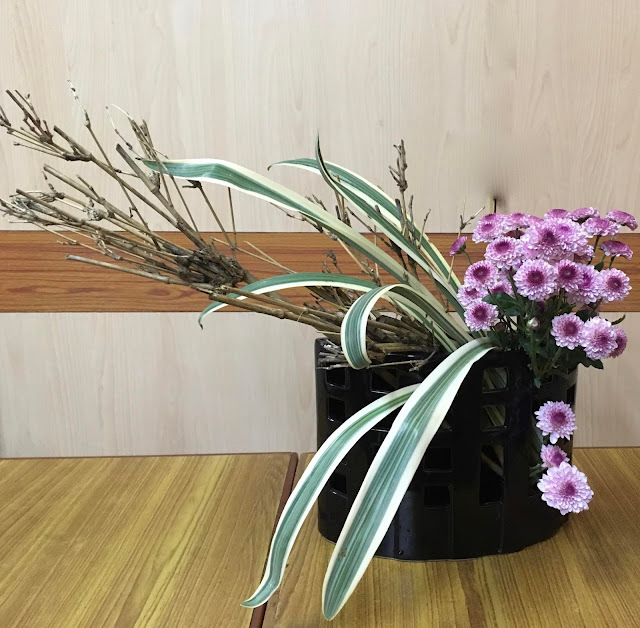 vase with which to work as well. 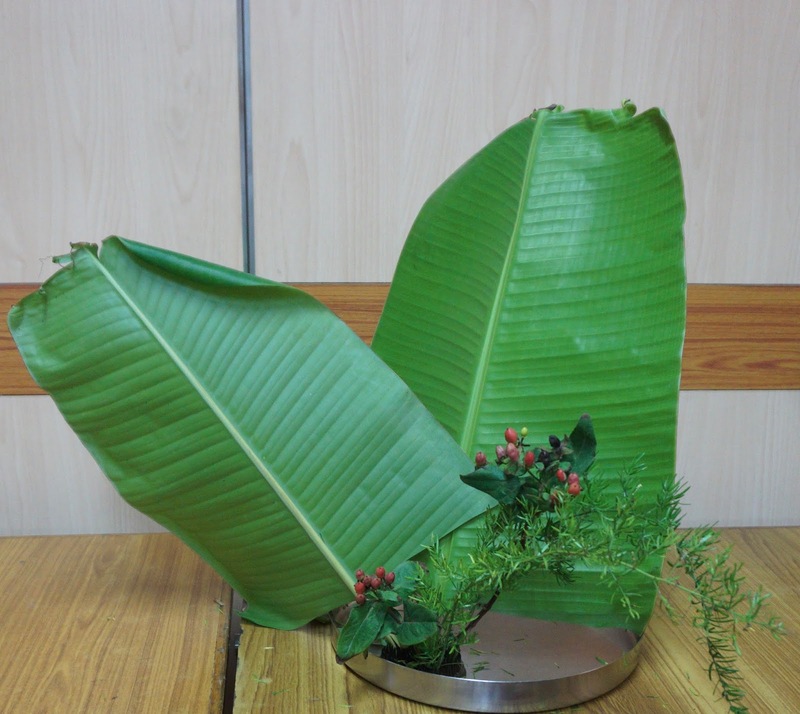 It was then the turn of the members to work with banana leaves. and take some beautiful shapes. 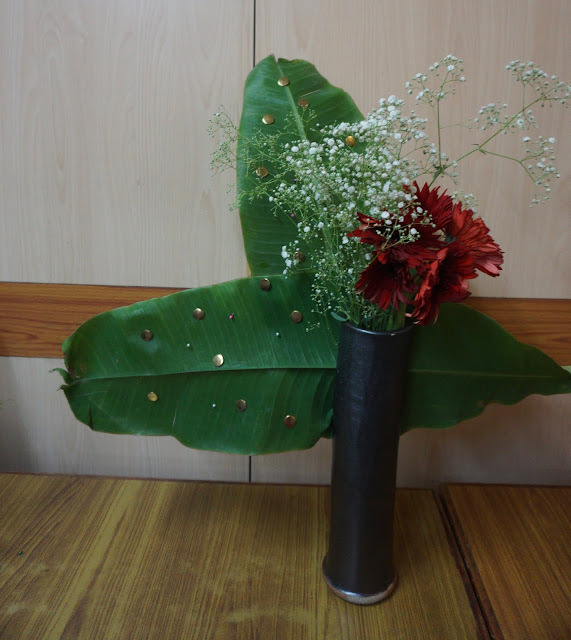 Sensei Malathi used board pins to recreate a starry sky from her childhood. 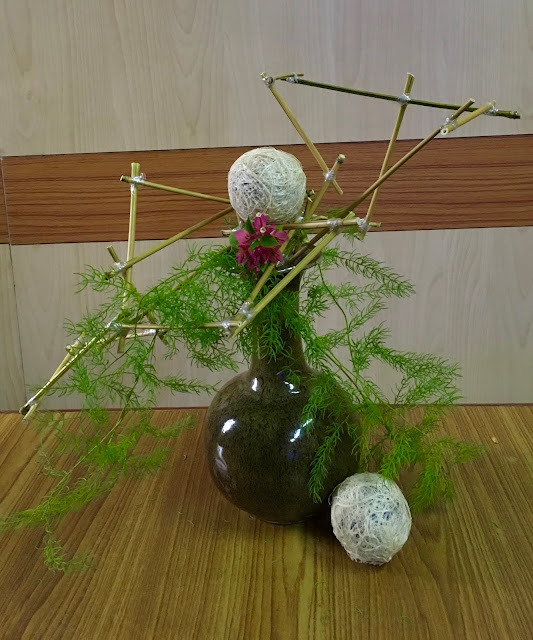 complemented the vase as well. creating a completely different effect. Sensei Trishala used green and brown leaves to create this dynamic composition. 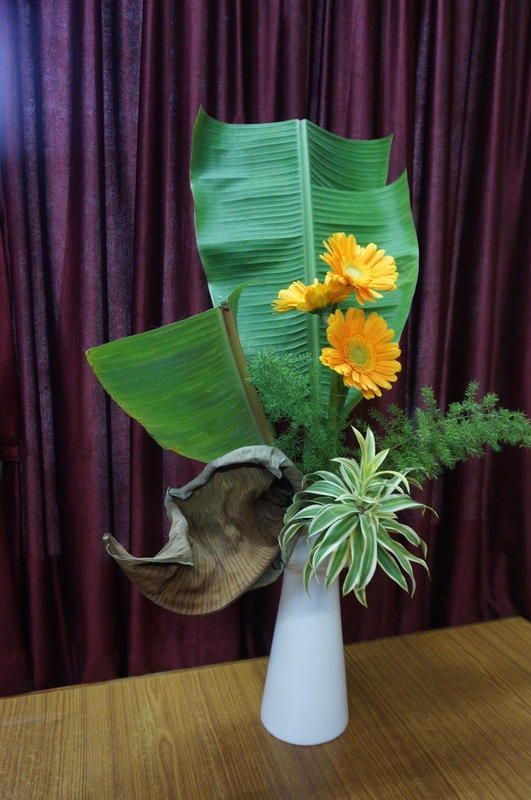 Mohan tried using the banana leaves in a modification of the Open style. 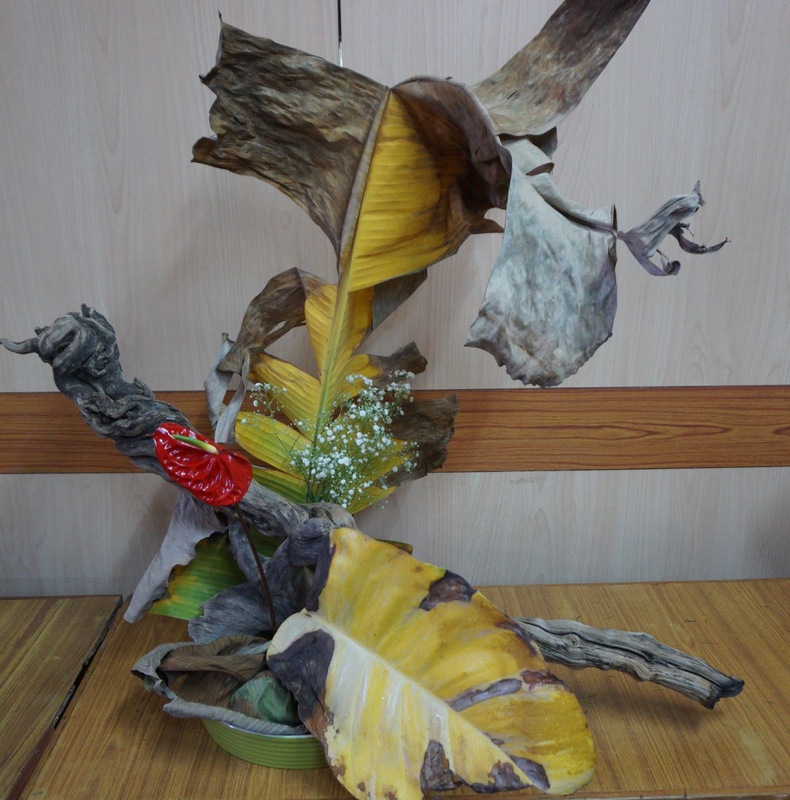 Jyotsna's experiment with cutting the leaves created a sailboat-like effect, beautifully. Sensei Meenu used strips of the leaf to carry forth her design. 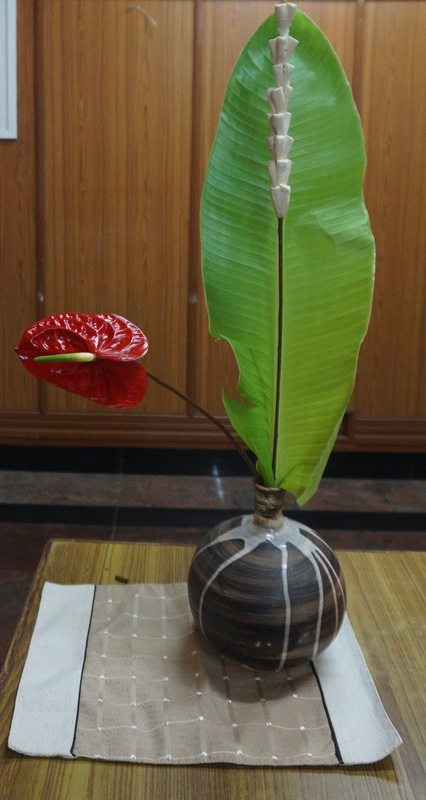 Bhuvana was able to create a line out of the banana leaf, quite unusual interpretation from the rest. It was indeed a wide variety of interpretations and it was a satisfying workshop indeed.